By the first photo, I'll bet you can tell what I'm doing this morning. Binding. 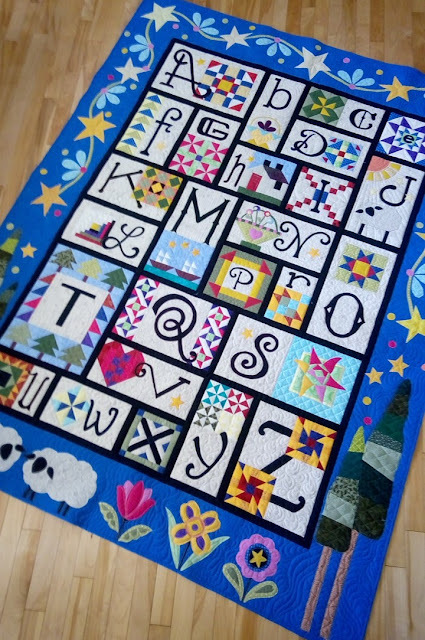 I taught a class to the Oromocto Quilters Guild on Saturday. 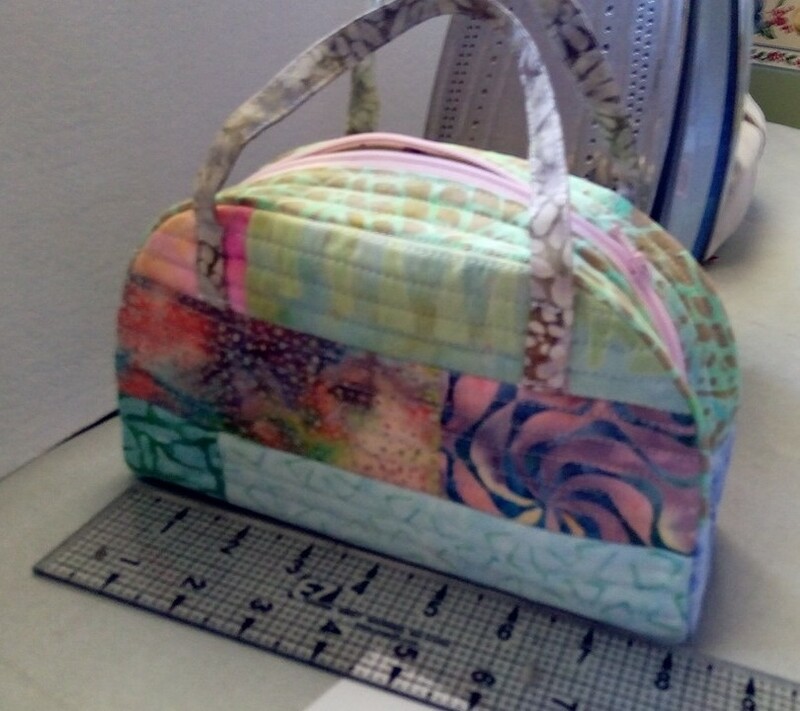 The class was about free motion quilting on your home sewing machine.. Its a very satisfying class to teach. It wasn't very long before the participants were all just stitching away at various designs. It was a lovely day with these girls, and while I did a bit of stitching for demonstrations, it wasn't very much. Well, that night, mind kind of stitched all through the night, if you know what I mean. Yesterday morning, I woke with a plan to scratch my stitching itch, I whipped up an easy and simple table runner out of 4.5 inch batik blocks. It wasn't long before I was doing some simple stitching. After finishing up all the stitching, and squaring up, I prepared the binding. The binding would wait until today. It's one of my favorite parts of doing a project. I'll use this runner as a sample when I teach my next free motion class. Next Saturday! 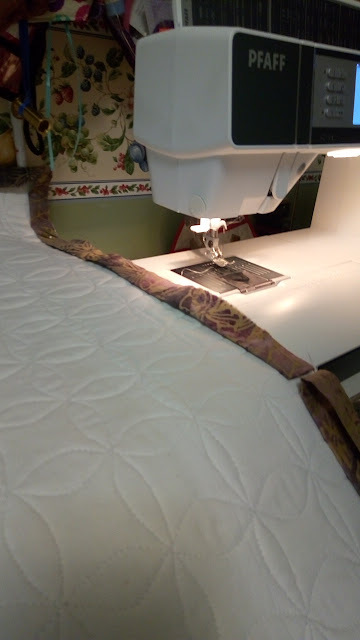 I'm adding my binding to the back. Then I'll stitch down with my Pfaff Bi-level foot. I love binding with that foot. . I love the gentle curved effect. This is the orange peel design. Not much marking is needed. Just a dot to note the middle of the square. This is the overall look of the runner.I chose medium fabrics. I tried to do a random placement of the squares. It is sort of random, but there is a non-obvious pattern. 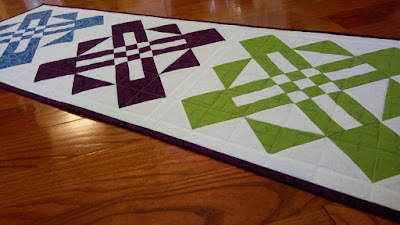 My quilting projects have taken me to the garage. Wood, paint, sanding, varathane. Got a couple of coats of paint on before the rain started. It's now raining. Coats of paint are taking longer than usual to dry. Check back in a couple of days to see what I've made. I'm tidying up my sewing room. Like many of you, I have partly made projects. 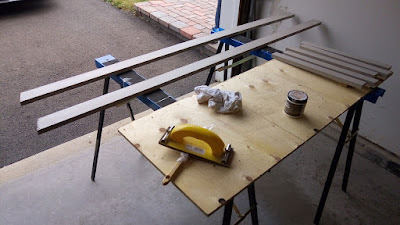 This week I finished up two small projects that have been taking up valuable space on my ironing board. Aurora mentioned to me that she would like to give her teacher a pencil case gift for Christmas. I asked her to write a note and put it on my sewing machine, so that I wouldn't forget. 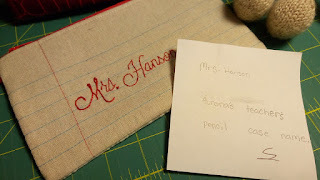 So I stitched the pencil case and it's all ready to bring to her next time we visit. I love it when a kid enjoys giving a gift. I'm playing with different wallet fabrics again. 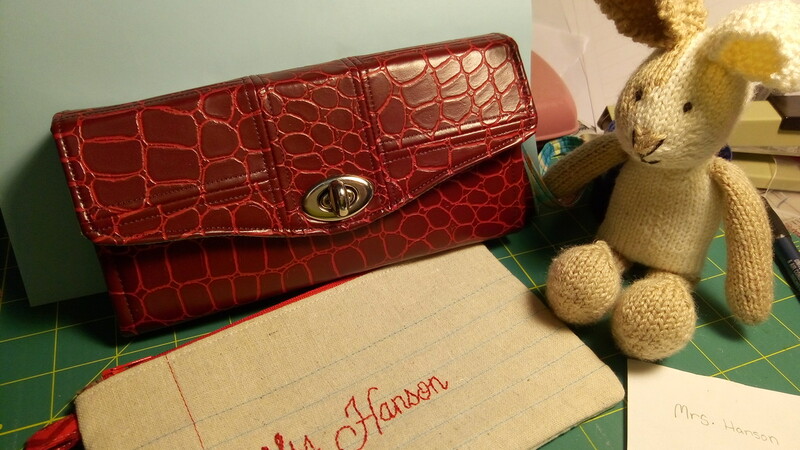 I couldn't resist this red alligator plastic leather... pleather. It was quite thin so I figured why not. Sure enough, one of my kiddos, has claimed it... I'll give it to her in her Christmas package. 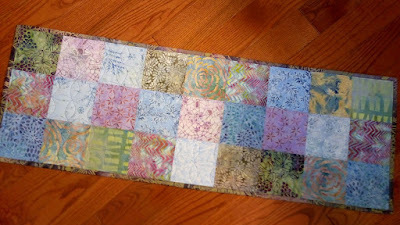 I just love this 3-block table runner. It's called Crossroads from the book Town Square. I made one for my sister last year and I just loved making it. It looks like a complicated block, but it's not. This runner was made for a friend who has a new cottage by a river in a small community not far from here. She has a large dining room table, and I knew this would be perfect. 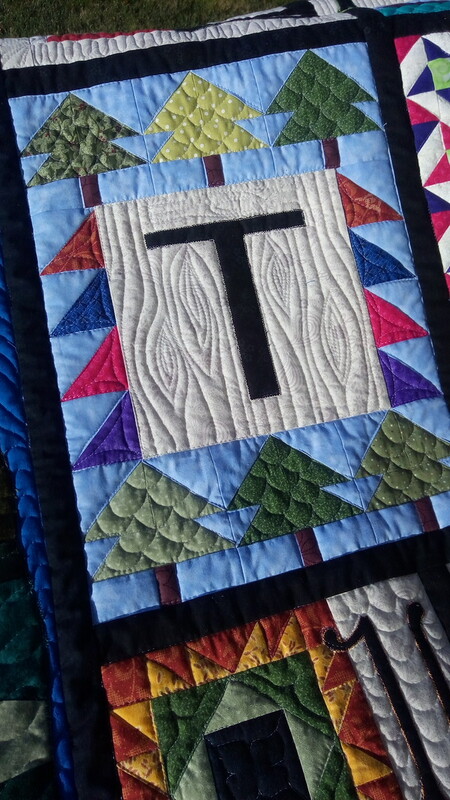 It's quilted simply with my walking foot. Simple is good. Done is better! I'd like to present to you, my ABC quilt. 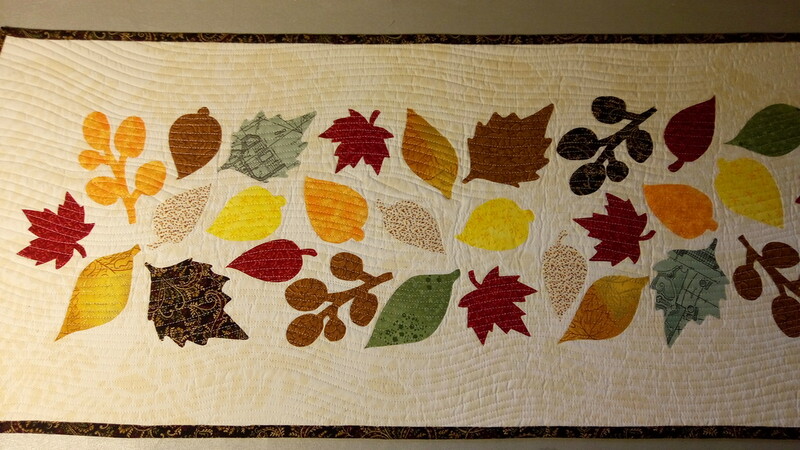 The pattern is by Janet Stone. 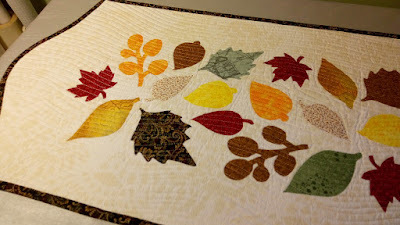 It was a block of the month program by the Quilt Show a couple of years ago. 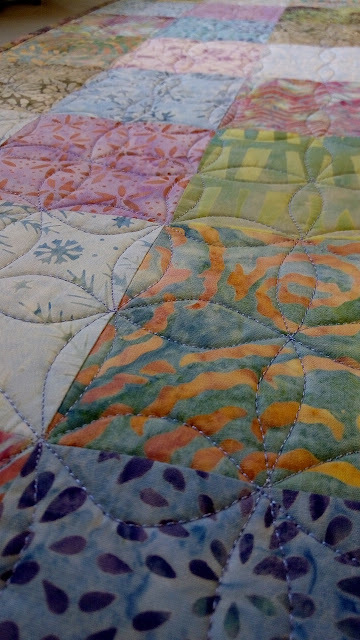 It was quilted by Andrea Renick. 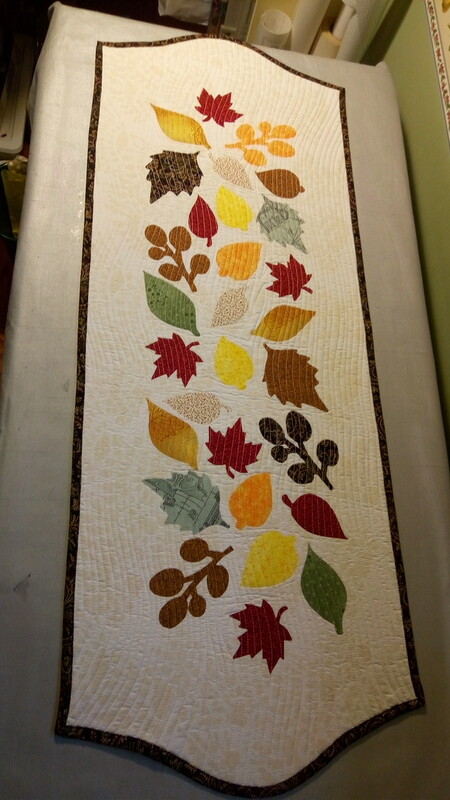 It's been hanging in my closet waiting for the quilting to be done. 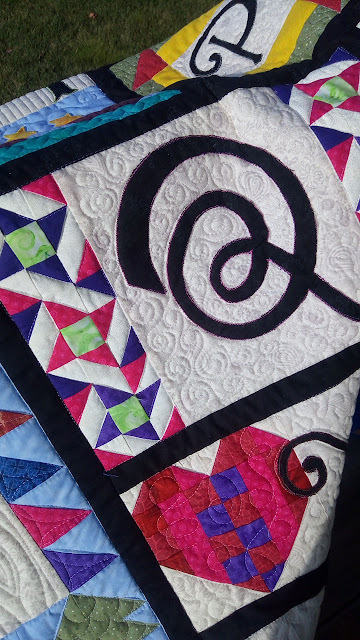 I saw Andrea Rennick's freehand quilted quilts at the Keswick Quilt Show a couple of weeks ago, and I knew that's what I wanted for this quilt. Andrea finished it in record time, and left me some little surprises in the quilting. So far, I've found the spider, the kite, and the dragonfly. I love my curly little sheep. Last evening at the guild meeting, she said "Did you find the Cat?" It shocked me. There's a cat in my Quilt? I thought I had all the little "Easter Eggs" so I was surprised to know that there is still a cat hidden in my quilt. Today, I'm looking for the little cat and it has still not revealed itself. If you spot the cat, don't tell me where it is. I want to find it myself. Thanks Andrea, for the fantastic job on my ABC quilt. 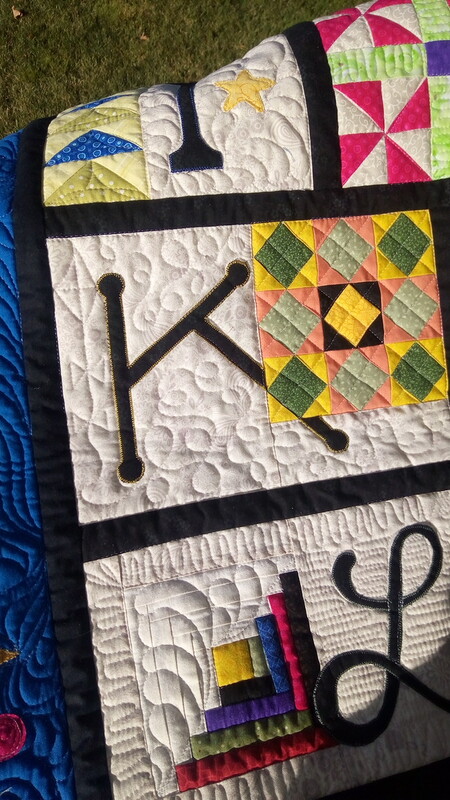 Here are some closeups for you to see the fun details.. 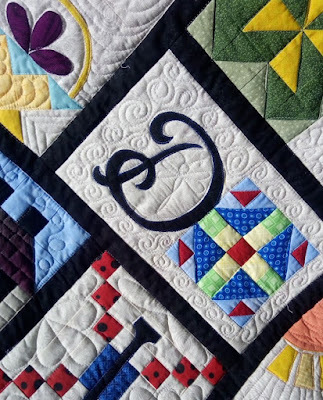 The quilting around the Q look like little q's. The Kite with a looooong string. I also love the plaid quilting in the block. This little bag is a Mini Boston Bag. I found the pattern pieces on a Pinterest link the other day. I loved the shape. After printing off the pattern, it was time to give it a try. It's a Japanese pattern. I figured out measurements and made up what I didn't know. There's not much in the way of instructions, but work at it, and you'll figure it out.. So, this is a scrappy prototype you might say. I love little bags and will find some some sewing and quilting notions to store in it. I really like it. 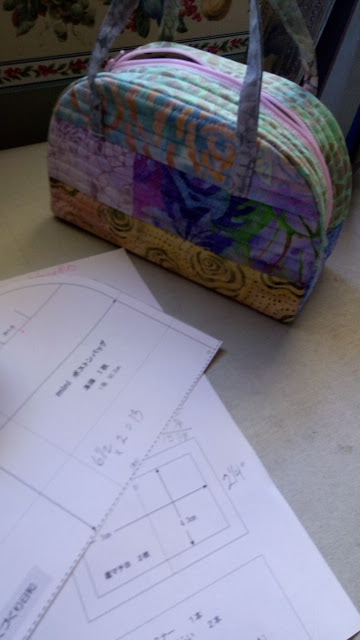 I may try to find a larger Boston Bag pattern to give it a try. That song has been in my head all weekend. 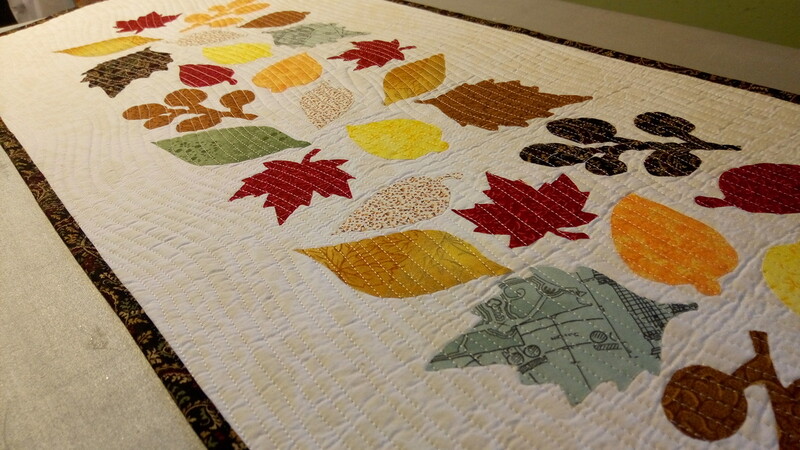 If you want a super fast, but showy fall runner, this might just be the project for you. This was made last minute for Thanksgiving. Now while I was in a hurry to make it, and finished it before our big turkey dinner, it never was actually put on the dinner table. Because it was very light cream/white, and thinking of gravy, cranberry jelly, etc, it actually just hung it on the wall. 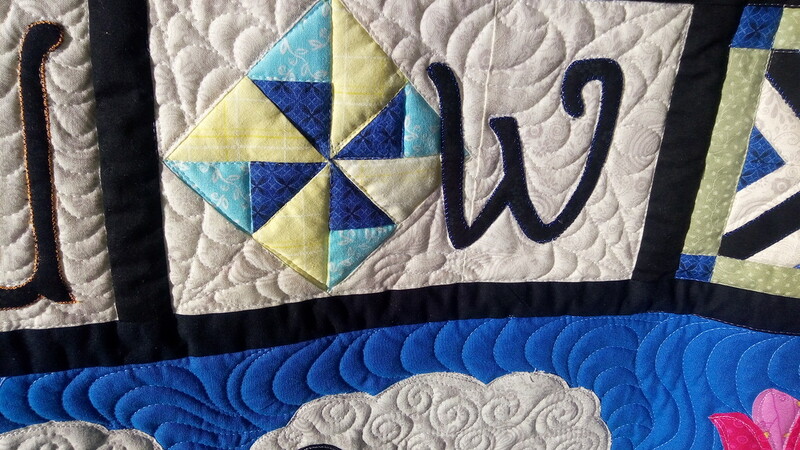 As I was making it and quilting those curvy lines, I was humming/singing the song, "Four Strong Winds" in my head. Our walking trails are exactly like this. 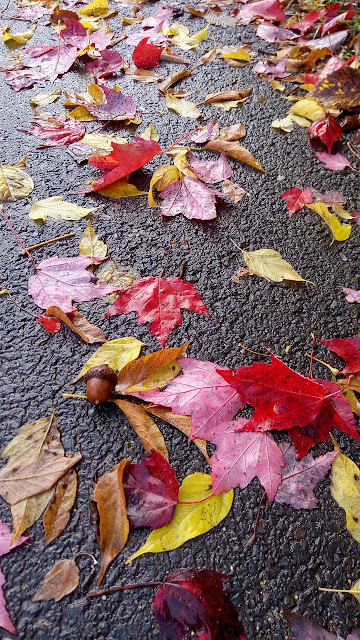 Leaves of every shape and color lie on the ground, especially after a windy rainfall. This design is by Nicole Daksiewicz of Modern Handcraft. 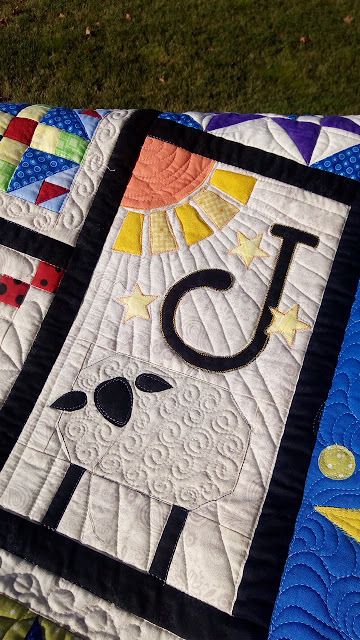 Her tutorial uses designs for your Silhouette fabric cutter. I just loved making this very easy project, and it was so quick, I just might make another. It's fun to prepare for a big family Thanksgiving dinner. On Sunday, we will be 10 for supper. There will be a big turkey with all the fixings. I've been working off a to-do-in-advance list. The groceries are bought; the day-old bread has been cut up to dry for stuffing. I'll be making two pies for desert so I've made the pie crusts and froze them ahead of time. On Sunday, they'll be filled and put into the oven early. before the Turkey has to go in. So, now we just have to wait for Sunday. I'm so looking forward. And you've seen my fabulous lattice pies recently. 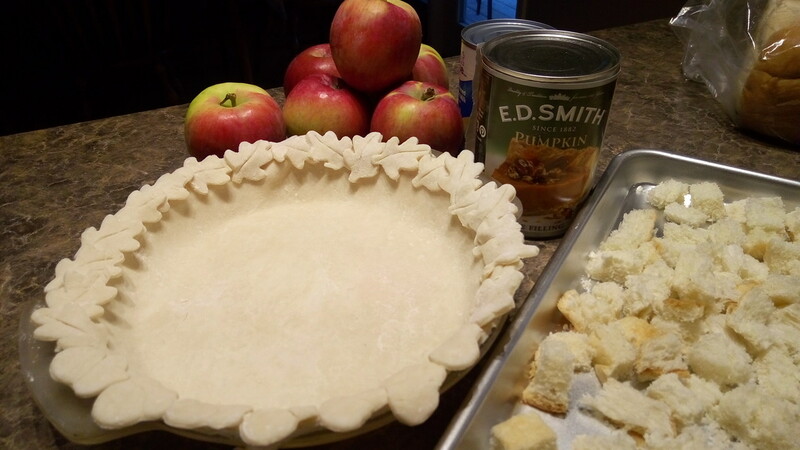 I did prepare one of those for Sunday, but I've also made this simple single pie crust for the pumpkin pie. It will have oak leaves and acorns all around the pie crust edge. I've never done one like this before, so I'm experimenting a bit and excited to see how it cooks. Well, we have a lot to give Thanks for this weekend. 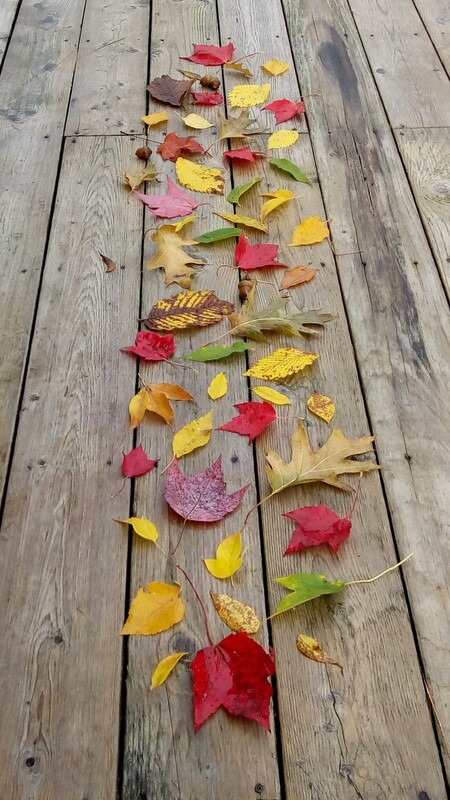 Good Health, A Loving Family, Wonderful Friends and Neighbours and A Great Harvest. 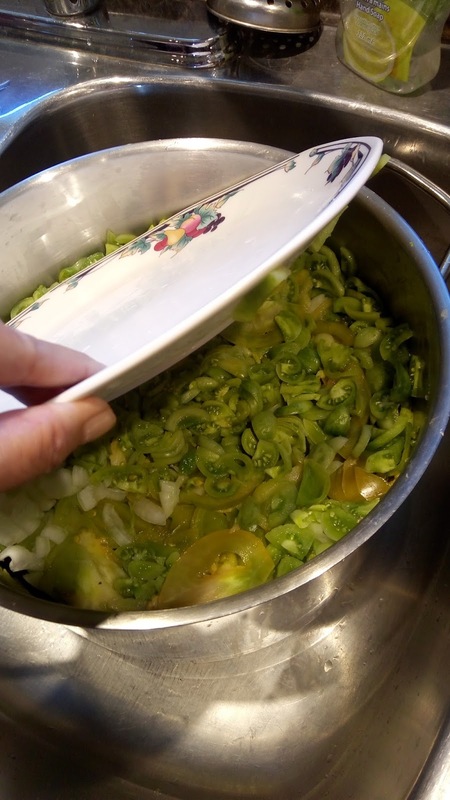 Now using my husbands mother's recipe that we were able to get from our niece Brenda, we cut up our big pot full of green tomatoes and onions to make the chow. We put a plate on top of the salted sliced veggies to weight them down overnight. Today is the day we cook. After draining, rinsing and adding vinegar, spices and sugar, we are simply instructed to cook all morning and bottle. 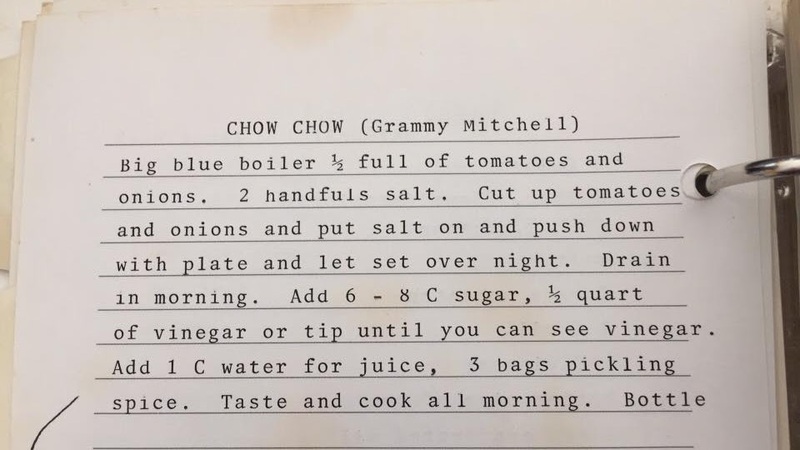 If you think of cooking in the '50's, and 60's, more than likely, the recipes were cooked on a wood stove. My husband said this was the case in his childhood home. This would have simmered all morning on the wood stove. I wonder who in the Mitchell family has the "Big Blue Boiler" pot. It must have been a big pot. I am using my large Paderno stock pot, and it's pretty big. I think of how busy she must have been in the fall. 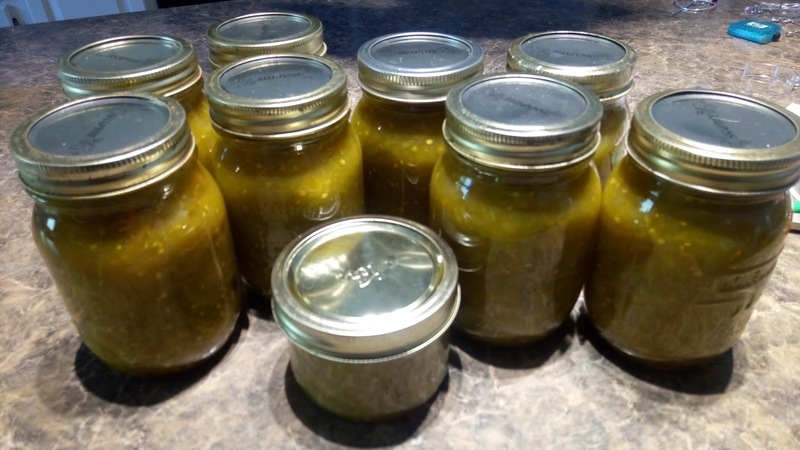 Preparing pickles and other preserves from the fall harvest in her garden. Of the 13 kids, she would have had at least 6 or 7 at home. My husband was the youngest. 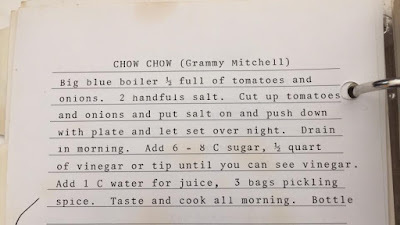 I expect she might have made several batches of chow. All the family talk fondly of eating this with potatoes.. I would add this note to the recipe. Stir often to prevent scorching!